. . .ing had been made in the centre of it, and huge wooden stands had been built about this circle. They were covered finely with cloth of red and gold; and many flags and banners were flying above the tops and about the stands. The blare and discord of trumpets rang out over the noise of the people. A great clamor of voices betokened the arrival of some great man at the front of the chief stand. "The Sheriff has arrived," cried Stuteley, who knew the ways at these affairs. "Hear how the people do cheer him! For sure he must be a man well liked——"
"These fellows will applaud anyone who has power and office," said Warrenton, scornfully. "Master Monceux is not beloved of them, for all that. But hasten, or we shall be shut out. Already they are closing the gates." The clouds were heavy and grey, and a few large drops of rain began to patter down. "Look to our bows, Warrenton," cried Robin, in alarm. It was very cool to read the stories without the biases of movies or plays. This seemed less like a legend and more like a story. It was very interesting to see the motivations of the characters. Really cool. The books starts off slow and did not catch my interest until almost halfway through. I found the second half to be a highly entertaining story. So much so, that it completely offset the initial lack of interest I had in it. I highly recommend this book. Love the flow of this language - a bit of the old and still understandable. 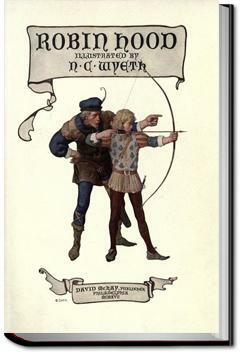 Fits the day of Robin Hood, and the adventures are great to read. Fun! It's been a while. Not my favourite read. Love (most) of the movies. While I love my classics, I don't think I will revisit this one again. For a kid brought up on the Errol Flynn and Disney versions of these tales, this came as...I dunno. A shock? A letdown? Not nearly as clean-cut and fol-de-rol. I'd highly recommend for children as a resource for historical fables/fiction, or classics.